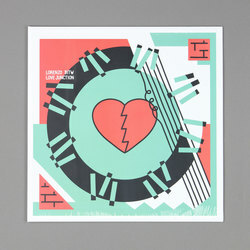 Lorenzo BITW - Love Junction. Vinyl LP. Bleep. After limbering up with the drops of his Kanaan and Chasing EPs earlier in 2018, Lorenzo BITW brings out his debut full-length via Friends Of Friends (Shlohmo, Groundislava). The Roman producer demonstrates a great knack for synthesising European, sub-Saharan African and Caribbean club and pop styles on Love Junction. Everything from Batida to Afrobeats to Soca to South African House shows up across these eleven tracks, and guest vocalists including Nawtyboi Tattoo and Kwam each bring their own unique flavour to the party. Lorenzo’s productions have a nice snappy feel to them and are richly melodic. Overall this is a fun, fresh album that never sounds like it’s trying too hard.